You'll never, ever guess where it's too hot to cook - still?! Yep, it's still pretty near sweltering here, so I still have little interest in flipping on even one stove burner. 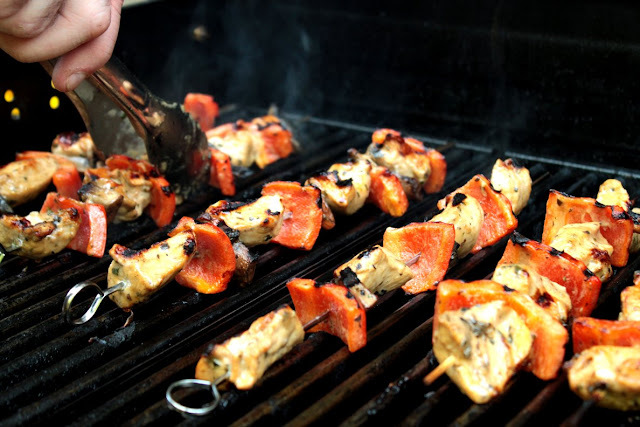 So, just like last week, I whipped up a new marinade and let Bo work his magic at the grill. And, if I'm being honest? This recipe is so, so, so good!! 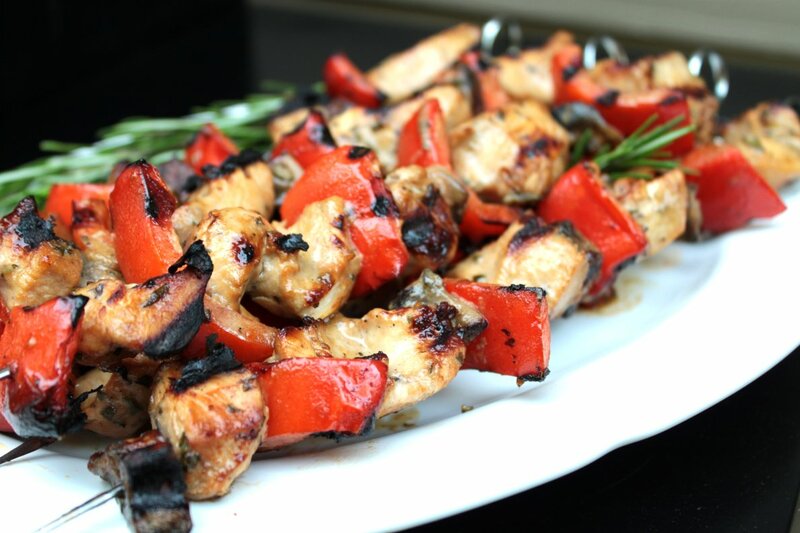 The chicken turned out so juicy and flavorful; we'll absolutely be making this recipe a lot this summer. Just like last week's recipe, this is very quick to throw together, and it cooks up quickly. 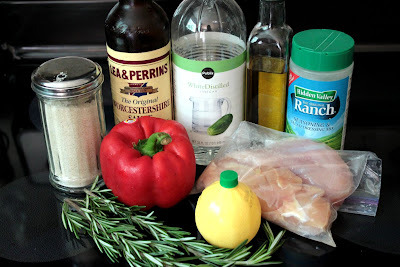 You could put the chicken and bell peppers into the sauce the night before or the morning of your dinner, and then get a finished dinner to the table in less than 30 minutes. You could also make this a vegetarian recipe by swapping out the chicken for portobello mushrooms. I cooked up a few mushrooms just to try it out, and I ended up loving the mushrooms most! In a medium bowl, stir together all the sauce ingredients. Let stand for 5 minutes, while you cut the chicken and bell pepper into 1 inch pieces. 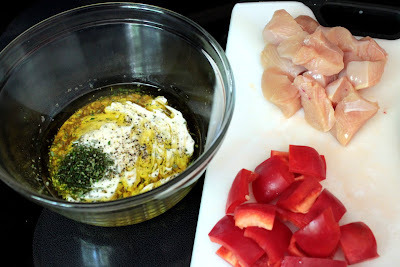 Place chicken and bell pepper in the bowl, and stir to coat with the marinade. 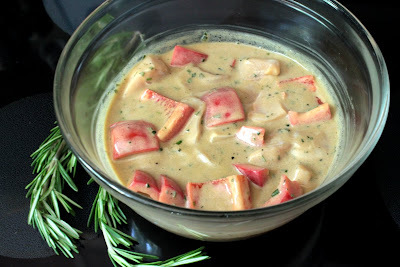 Cover and refrigerate for 30 minutes, or up to overnight. Preheat the grill for medium-high heat. Thread chicken onto skewers and discard marinade. Lightly oil the grill grate. 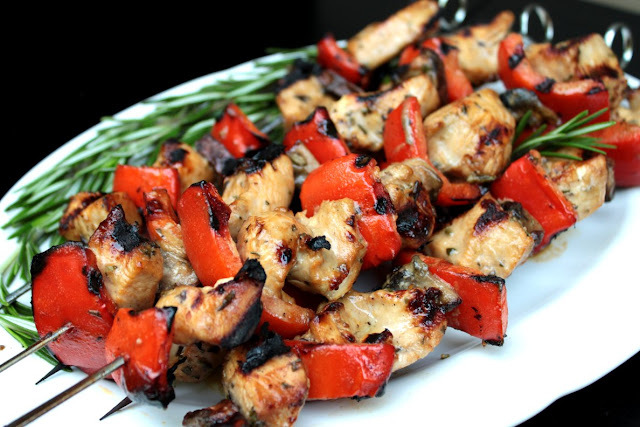 Grill skewers for 8 to 12 minutes, or until the chicken is no longer pink in the center, and the juices run clear. * Note: You can definitely use bottled ranch dressing, but I make my own so that I can use almond milk and light mayo. Either will work just fine. Cover with plastic wrap and refrigerate for at least 30 minutes, up to overnight. Grill 8-12 minutes, or until chicken is cooked through. This looks very good, and since you mention that it does well with a portobello mushroom it might be right up Leesha's alley.